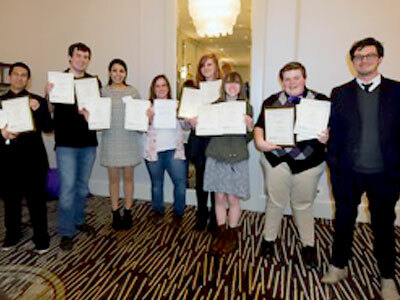 Elmhurst College’s student newspaper, The Leader, came home from the Illinois College Press Association conference in February with 16 awards, including the coveted first place in General Excellence. At the annual ICPA conference at Chicago’s DoubleTree hotel, Leader staff attended workshops, discussions and a keynote from Chicago Sun-Times editor-in-chief Jim Kirk. The weekend-long conference culminated in the February 20 awards luncheon, where The Leader won awards in everything from feature page design to sports column to general excellence. The Leader competed for awards against other institutions in the “Non-Dailies under 4,000” category. The victory comes after a year of staff transitions; currently, the paper is operating without a graphics or sports editor. Faculty advisor Eric Lutz said he’s been proud to see the journalists rise to the everyday challenges of running the paper. The Leader staff members aren’t sure yet how they’re going to celebrate their victories. Before that, they have to put out the upcoming issue of the paper. “Well, first we’re hanging all those new plaques in the office,” says Astra.